I spend a lot of time thinking about games. In fact, I even spend a lot of time writing about games. I have a whole other blog about philosophy and gaming, called TPK (blatant plug). It focuses on how we can apply philosophical concepts to improve our gaming experience, but I think that’s a two way street. I think we can use ideas and concepts from games to improve the ways in which we live our lives. Today I want to go over some of those concepts, and talk briefly about how they can assist us. This isn’t exactly a new idea. People have constructed games around useful ideas and used them to learn things about those ideas for a very long time. Chess and go are great examples of this. 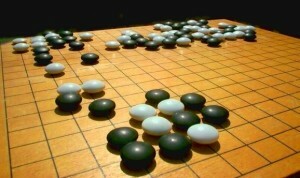 They’re abstractions from actual warfare, but they promote ways of thinking which can make one an effective general. We can see some really interesting evidence of people doing this even now, where people use the skills they’ve learned in Magic: the Gathering to win poker tournaments. My game of choice is, more often than not, Dungeons and Dragons (D&D), and I think that there’s some interesting things we can learn from how we play it and how we think we should play it. 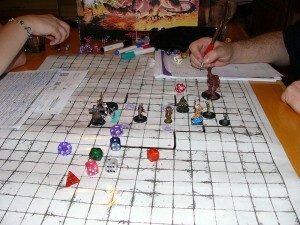 Dungeons and Dragons is a roleplaying game, which mixes strategy elements and theatre. You and a number of friends take on the role of a character in a fantasy setting, exploring it and acting on your character’s desires and values. It’s an action/adventure game, so exploring the setting often involves the characters fighting monsters, sneaking around dark caverns, and waving crossbows. One of the players takes on the role of the GM, moderating the game by adjudicating rule calls and mediating how the characters interact with the setting. In essence, they play all of the people with whom the characters converse, as well as controlling the monsters and the like. With all of that in mind, I think there’s three things which D&D can help us learn right off the bat. Stakes: As a strategy game, it can help us think about the kinds of ways that we make decisions under risk. How do certain kinds of stakes affect our decisions, and how do we think they should? The way you make decisions in the game will be different based on whether you view your character as an expendable avatar for your decisions in the setting, or if you think about their values contextually, and the kinds of risks they would be willing to take. It can push you to ask questions about what’s really on the line, and how best to take that into account. Standpoint: The most important thing I think D&D lets us do is try to walk a mile in someone else’s shoes. It encourages you to see things from someone else’s perspective, and to imagine why they would make the decisions that they make. This is an invaluable skill, and can lend itself to a kind of empathetic engagement which we might otherwise find difficult to reach. There’s an element of escapism in this, that’s for sure, but even escapism makes us think abut the kinds of things we’d like to escape to, and why. Bernard Suits, in his book The Grasshopper, defines a game as willingly overcoming unnecessary obstacles, and that seems accurate. But in a game like D&D, which seeks to emulate a lot of the dimensions of real life, the act of overcoming those unnecessary and abstracted obstacles can be an excellent way of conditioning yourself to face the real thing. The earliest pokemon games helped me a lot with Lutheran theology. When I played them as a kid it was one thing, but to play them more seriously, it’s almost another game entirely, leaving the kid portion of the game almost meaningless. And when you delve deeper and you’re dealing with EVs and DVs, you’re into computational aspects of the game and it’s almost as if you’ve left the earth, you’re no longer a dude who leaves his mom to catch em all, but more like a chess player. I’ll admit, I haven’t played much pokemon since the first ones came out, but you’re definitely right that it’s a game that plays at different levels. I’m really interested in how it helped you with Lutheran theology. How did that come about?